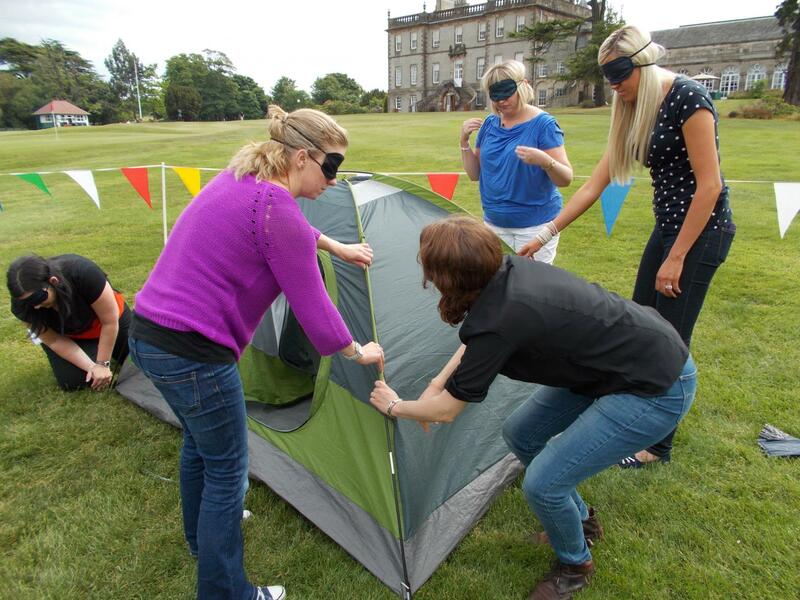 The team from Henderson Group had spent the day outside taking part in some Team Building Events on the beautiful Lusty Beg Island in County Fermanagh, they were treated to a surprise in the form of Evening Entertainment for Team Challenge Company. The teams were set and soon enough it was time to begin the nights festivity, the fantastic Pressure Zone. To warm up with an easy start we had a particularly tricky challenge, Flop It. Each team came and went, trying their hardest to beat the game under the tremendous pressure in order to walk away with some money in order to out their team ahead in the game. A few star players stood out and a few even gained some new nicknames such as Netball Brenda due to her throwing tactics! After a break in the evening where our teams had their starters, the next game was ready! Descent is another tricky game where the pressure is incredibly high! Everyone had their own style in this game, Glen in particular decided to try his best and cheat his way to victory. Luckily for the other teams we were keeping our eyes open and so he didn't get away with it! Sam also decided to try out something different, going for a kick rather than a catch! Unfortunately, it didn't work this time! Another break for the main course of the meal and then it was back up again for yet another high pressure round. Drop Zone was a talking point of the night. "Surely it can't be hard" was the most over said phrase of the night and I'm sure it was dis-proven! Our champions in this round was June who managed to get it into the hole not only once but twice. Definitely a professional! With the money building up and the teams getting more and more competitive we finally made it to the final round, with the added bonus being double money! Each team came up in turn and had a time limit of 90 seconds each to get as many shots as they could! This was definitely the most hectic part of the evening with rubber balls flying all over the room. After everyone had been to play there was nothing left to be done, the money was counted and the scores were in. One team would be walking away with the Team Challenge Company Trophy and one team would be leaving with the dreaded Wooden Spoon. They tried their best but unfortunately Team 8 couldn't fight their way to a win! We worked our way through the rest of the teams, each coming up for a group photo and for Team 7 it was a bit of a pile up when they found out they weren't last! Our lucky winner of the night was Team Number 6 with a fantastic score of £1500, a whole £300 on top of second place! The night was an incredible success and a huge thanks goes out to Bronagh and the whole team for planning the night! I thought I was just brilliant.....! !